My great uncle Herbert Hartley and his wife Maud lived next door to the Brammer family on Wakefield Road in Flushdyke in the 1940s. Herbert was a banksman at nearby Roundwood Colliery and one of the perks of his job was a supply of free coal that was delivered by horse and cart, owned by the Ossett Co-operative Society. 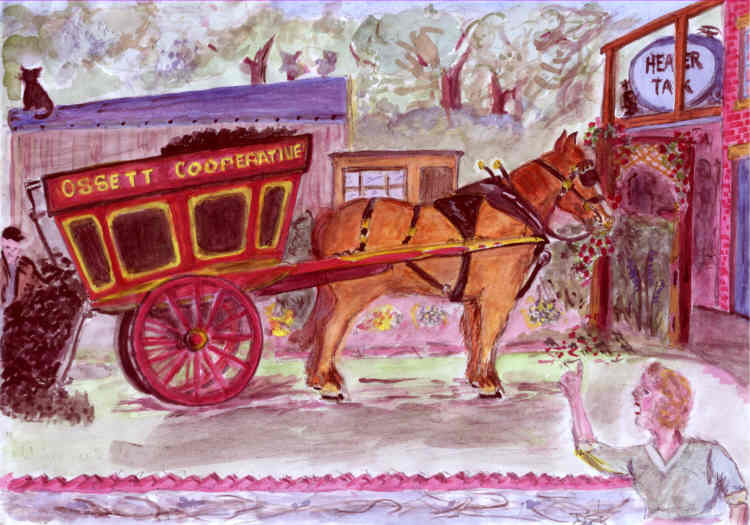 This picture shows the Roundwood coal being delivered at the Hartley's house, but with a very angry Mrs. Brammer remonstrating with the delivery man because the horse is eating her prize roses after ploughing up the back garden. Access to the rear of these terraced houses involved the horse and cart being backed up a very narrow passage between the terraced houses and the toffee factory next door.